On this page we take a look at how the whole assembly of sledge, tracks and rope rolls works, if installed on the 52° angled flank of Khufu's pyramid. About the rope roll and about the sledge on tracks there are separate pages, please read the details there! How are Franz Löhners rope rolls used on the pyramid flank? The track system consists of tracks and a ladder-like rig installed to left and right of the tracks. Rope rolls are installed in pairs and constitute a rope roll station. Those stations are installed every 30-37 meters of height on the pyramid side. The top most rope roll station on the edge has a more complicated setup. 3. New The rope roll (wooden block with a roll) and the tracks and ladder-like rigs are installed and anchored on outer stones which are left protruding, and tied down. The rope roll stations are installed in series so a sledge with a stone can be hauled up over several rope roll stations in one continuous movement, without stopping and restarting. When arriving on the edge of the pyramid plateau, the sledge is tilted and then hauled on tracks to the exact position, where the stone is levered and laid down at its intended place. It's important, that the rope roll stations operate in series. Every 30-37m a rope roll station is installed and operated by a team of 55 men (haulers and helpers) A stone, that has to reach the very top of the pyramid (146.59 meters) would pass a total of 4 rope roll stations in one continuous movement until arriving at the top. First there are a total of five tracks, but because the volume of stones needed is less with every new layer, they can be reduced over time first to three tracks, then to a single track which leads up to the very tip of the pyramid. Of course if you increase the number of track systems used at the beginning, the time to build the pyramid can be reduced much. We think, that it was also possible to build the pyramid of Khufu in only 10 to 15 years, if at the beginning all four sides of the pyramid were used to install tracks and rope roll stations and this without raising the number of workers too much! Franz Löhner suggests a very simple method - the tracks and rails are anchored directly on the stones of the pyramid flank. The position and shape of the anchoring stones have to be planned right from the beginning, when you start building the first stone layer. The position of the track system has to be determined and then special Tura stones (outer casing blocks) are left protruding. Depending on their function the shape of the stone would differ. After finishing the pyramid by laying the pyramidion on its top, the stone bosses were chiseled off and the stone smoothed. The protruding Tura stones prevent, that the tracks and ladder-like rigs are pulled down by the weight of the stone blocks. The tracks have to bear not that much of the load, because most of the weight is sustained by the rope rolls. The ladder-like rig is further secured by a guardrail made from ropes, so falls can be prevented. The rope rolls have to be very well anchored indead, because they bear most of the load. The weight of the stones plus the sledge (2800 kg), and at the moment when the friction is surmounted also the weight of the haulers pulling at the ropes (24 to 48 men = app. 1400 to 3000 kg) is sustained by the rope roll. And this force is transferred through frictional connection from the rope roll to the underlying stone. The rope rolls are also anchored directly on the pyramid flank. Some outer Tura stones with a special form are left protruding every 30-37m. They are angled up in such a way, that the rope rolls can be laid atop and then tied down either with ropes or encased with wood. They have to be specially well interlocked with the wall to distribute the load. The stones are put down as headers, that is a masonry unit which is laid flat with its longest dimension perpendicular to the face of the wall. Headers reach deeply into the core masonry und thus give special stability to the whole wall. Not on the drawing: rope roll is additionally tied down with ropes or encased with wood. A slit is chiseled into the stone just underneath the rope roll, so the rope going to the sledge doesn't chafe. Tura stone is a soft limestone and can be worked easily but after some time becomes harder when exposed to air. After finishing the pyramid by laying the pyramidion on its top, these stone bosses are chiseled off and the stone smoothed. On stretches with a slight gradient (5° or more), for example from the quarries to the foot of the pyramid or from the harbor to the pyramid, tracks with rope roll stations are installed as well, but only every 75 meters, so much longer ropes were used for hauling. Here it is much easier to anchor the rope rolls, all you have to do is place a pole next to it and anchor it with ropes. The stone blocks in the lower 10 courses were the largest - 1m by 2.5m and 1-1.5m high and weighting 6.5 - 10 tons . They were built around the rock outcropping in the middle which goes up to at least 7m. For the first 7 meters (= 6 stone layers) it was not yet possible to build the tracks directly on the pyramid flank, because the sledges were too long to position correctly for starting. For these few meters, small auxiliary ramps had to be built. Thanks to using rope rolls for hauling, these ramps can be built much steeper, than is normally suggested by Egyptologists for transport ramps. Instead of 5 to 10° these ramps could be up to 30° steep. A rope roll station was placed on the edge of the pyramid and the ramps, each with tracks installed on top, were leading up to the plateau. Such an auxiliary ramp would only be 12m long at the base - the ramp was protruding 6.6 meters onto the pavemenet at the pyramid base. At least five such ramps, built solidly with smaller stone blocks and with tracks installed on top had to be built (if you use more track systems, for example on all sides of the pyramid, you would need more small ramps). Franz Löhner thinks, that at the latest when building the 7th or 8th course (height ≈ 8-9m), it was better to dismantle the auxiliary ramps and start hauling the sledges up directly on the pyramid flank. At the foot of the pyramid the abrupt change from plane ground to the 52° inclination had to be planned well. It was important, that the sledge should lie on the rail with its rear and not its front cross piece. To achieve this, a small layer up to about 2m height had to be laid down, slightly curved upward toward the flank and the tracks laid down on top. This layer (not a ramp), although not very high had to be very stable, since it had to hold during the rest of the construction time. Thanks to the slight curve, the sledge was able to surmount the transition from plane ground to the flank without stopping and restarting. If you wanted to haul up one stone per minute, at least five tracks leading up the pyramid had to be installed. The largest quantity of stones had to be transported at the beginning, later when building progressed further up towards the top of the pyramid, the track systems were reduced to a single track leading up to the very top (=146.59m). There was an intermediate rope roll station consisting of two rope rolls installed on special Tura stones every 30-37m. One hauling team (Franz Löhner calculates a team of 48 haulers and 7 helpers = 55 men) was responsible for one leg of the route. From 30m height down the pyramid flank they had to walk a distance of 38 meters - at normal walking pace this would take them 2 minutes. As soon as one team has reached the foot of the pyramid the next team can start above, so on each track system a stone arrives about every 4 to 5 minutes - with five track systems working we achieve the required one stone per minute (if the pyramid is finished in 20 years). With additional track systems, for example installed on the other lateral surfaces of the pyramid, it would be possible to increase the output and thus reduce the time for building considerably. Just before each intermediate station the ropes attached to the sledge had to be changed from one hauling team to the next one. The best solution is to do that, while the sledge is still moving. Every time the sledge has to be stopped and restarted you have to overcome the static friction (stiction) between sledge and tracks. Changing ropes at the uppermost station was more complicated and had to be monitored by specially competent overseers. A hauling team on the pyramid flank starts up at the intermediate rope roll station and walks down the ladder-like rig thus pulling up the sledge with the stone. Just before the sledge reaches the intermediate station, the ropes are changed. The second hauling team waits up at the second station and now starts to walk down, thereby pulling the sledge up further. When the second hauling team takes over, the rope of the first team is lowered down to the sledge waiting at the foot of the pyramid. A second hauling team which is standing by waiting, now takes over the hauling, while the first team starts walking up the pyramid to the first intermediate station. So for each leg of 35 meters there are two hauling teams assigned. The last rope roll station, the one at the top of the frustum of pyramid, was positioned on the very edge. This station looks very similar to the intermediate stations, only that here a large and broad Tura stone (2) with two rope rolls (1a and 1b) protrudes out over the edge to the pyramid plateau. A third rope roll (3) is placed about one and a half meters back on the plateau and anchored by another protruding stone (4) and some poles rammed into the stone underneath. The ropes attached to the sledge (red) lead up and over the first rope roll (1a) and then underneath the second rope roll (3). Then they lead back over the rope roll at the edge (1b) and to the hauling team. This kind of arrangement prevents, that the special outer Tura stone (2) tilts and is pulled from its place. At the edge of the pyramid plateau the hauling team has to be specially cautious, because the heavy stone has to be tilted from the slanting flank to level ground and could possibly hit the edge. This has to be avoided at all costs. At the second to last rope roll station, the main hauling ropes (red) are attached to the sledge not in front but on the cross pieces in the back of the sledge. An overseer is positioned at the edge and is giving precise instructions, how fast the haulers had to pull and when to stop. In such a way the tilting is controlled precisely. The ropes are attached to the sledge on both sides as follows: The main rope (red) goes from the cross piece in the back over the first rope roll (A), then around an additional rope roll (B) on the plateau and back over the first rope roll (A) to the hauling team which is walking down the pyramid flank. A second rope (blue) is attached to the cross piece in front of the sledge and leads directly between the two rope rolls over the edge. This rope is pulled by a second hauling team, that walks horizontally on the pyramid plateau. The edge is well protected by a cross beam (C), so the stone positioned underneath is not chipped or otherwise damaged by the many sledges arriving here. When the sledge arrives on the edge, it is pulled further, until it protrudes over the edge. Now it would normally tilt and hit the edge. 1 = two rope rolls (enlarged) anchored on a special Tura stone (2) / 3 = rope roll (enlarged) anchored with stone (4) / 5 = lengthened cross piece, anchored by two protruding stones (6) / 7 = rail / 8 = stone on sledge / 9= toggle, to adjust the tension of the rope (green). Hauling ropes are not shown. To avoid that the sledge hilts the edge there is a rope (green) stretched between the two stones where the rope rolls are anchored atop. The sole purpose of this rope is to absorb and cushion the movement of the sledge. A worker stands by and is adjusting the tension of the rope with a toggle (illustration = 9). 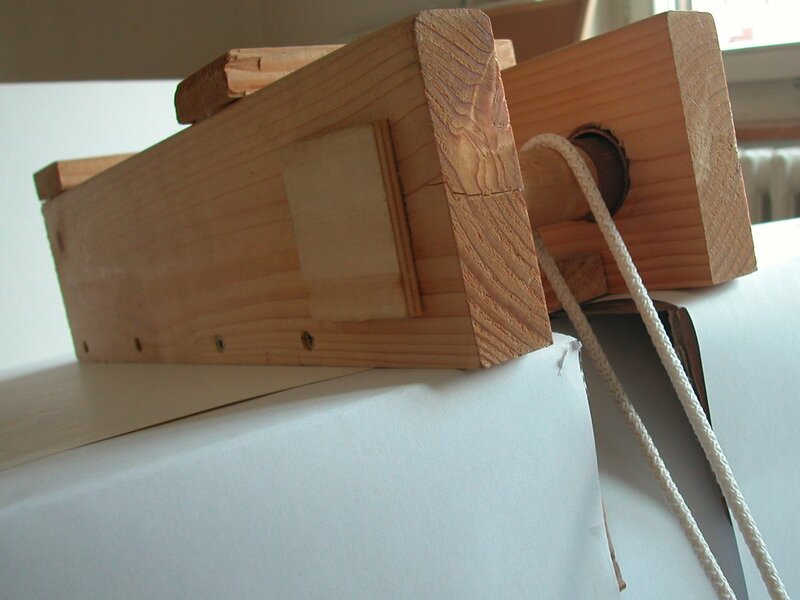 The sledge with the stone block on top is slowly tilted and through adjusting the tension of the rope across it can be lowered precisely to the ground. It is important, that the work on the pyramid plateau can progress smoothly and well coordinated. The stones have to be delivered in the correct order and the route to the place were they are set down has to be free of obstacles. No time could be wasted - one stone per minute was arriving on top and had to laid down immediately! Now the hauling teams pull the sledge (with the stone tied on top) on tracks on the pyramid plateau to its intended place. Now, and not earlier, the stone is removed from the sledge and with the help of levers laid accurately at its final location. The wooden tracks on the plateau are built in such a way, that they can be moved about, so the whole surface can be reached easily. The plateau is relatively flat, but even here it is better to use tracks, so there is as little friction between the sledges and the surface area on which they glide. On level ground we need only a hauling team of 12 men for a 2.5 tons block. The sledge is now brought back to the edge of the pyramid, attached to a long rope and let sliding down the pyramid side. From the foot of the pyramid it is brought back to the quarry, where the next stone is attached to it and the next journey begins. Franz Löhner remarks, that specially long stones, so called headers, that are put down, so they reach deep into the inner stone layers, can also be tied down on the sledge not lengthwise but widthwise and transported like that. Stones, that had to reach positions to the left and right of the rope roll station could also be hauled up widthwise. After having arrived on the plateau they didn't have to be turned by 90° with levers but could be transported straight away to their positions (on track), thus gaining time. How to lay down all those stones had to be planned minutely. For the outer casing probably the corner stones and some stones in the very middle of the pyramid side were set first. Specially large stones were used, so called headers. From these three fixed points the position of the other stones could be precisely determined . Since the outer stones was bevelled to the exact angle at the quarry, only the position and their exact placement had to be controlled. On the pyramid building site there were many risks - haulers can stumble and fall down, ropes can rip and stones can tumble down and other materials used, for example the cross pieces of the sledges or the rope rolls can break. But this kind of risk can be minimized with appropriate controls. Since freemen and not slaves worked on the building site, these kind of risks were surley minimized as much as possible - with a strict control of material and good training for the workers. While the sledge moves up the flank, two experienced men are safeguarding the transport. Levers are used behind and to the side, for example to adjust the direction the sledge is taking or if it is necessary to stop for a short moment. If the sledge has to be stopped for a longer amount of time, a stopping device in the form of a wooden triangle is inserted between the cross beam of the sledge and one of the cross piece of the track. The ladder-like rig is secured by a guardrail made from ropes, so falls can be prevented. What happens, if the maximum credible accident happens? In the worst case scenario a roll breaks or a rope roll is pulled from its anchoring - now the whole weight is deflected to the second rope roll. The whole sledge with the stone moves to one side and hangs just on one rope roll, but since the two rope rolls are not very far apart, the sledge is still lying on top of the tracks. Rope roll and ropes are strong and big enough, that they can - for a short time - bear double load, so the worst disaster doesn't happen immediately. But the hauling team, that was pulling on one side will loose their footing, while the other team might be jerked up. Since the ladder-like rig is quite small and with a guardrail, the men still have a good chance to hold onto it. They don't wear any constricting harness, so the crossbar handle can just be let go if in danger. Of course the remaining hauling team can not hold the sledge with the stone, but they probably were able to retard and brake its movement, so the men safeguarding the sledge might be able to insert the stopping device or some levers. Only if that cannot be achieved, the block will tumble down the pyramid flank.